In a few sentences we have the Palestinian position: no compromise on borders, refugees or Jerusalem. No room for Jews. It has a familiar ring to it. It’s instructive to ask exactly what justifies Qurei’s stubbornness. One of the places that the Palestinians do not wish to compromise on is Kibbutz Kfar Etzion, south of Jerusalem. Part of the Palestine Mandate from 1917 to 1948, and the Ottoman empire before that, it was purchased from local Arabs and settled by Yemenite Jews in 1927. They lived there on and off (they were driven out several times by Arab riots) until 1948 when the invading Jordanian army overran it and executed all but four of its defenders. All of the West Bank and East Jerusalem were made Jew-free by the Jordanians, who illegally occupied the area until 1967, when the kibbutz was reestablished. So please explain, Mr. Qurei, where the Palestinian claim comes from. And explain why it is that if Kfar Etzion did become part of your state, there would be no room for Jews in it. Will Palestine be a racist apartheid state? Our experiences have taught us that it’s impossible to coexist with these settlers. We still remember the [Tomb of the Patriarchs] massacre in Hebron in 1994 and the daily attacks carried out by settlers in Hebron, Nablus, Kalkilya and other places. In other words because a Jew, Baruch Goldstein, acted like an Arab terrorist (after which he and his act were denounced by all but a tiny sliver of Israel’s population), and because some Jewish settlers have become hostile in the face of constant hostility from Arabs — that is, because they have behaved like the imperfect human beings that they are — Jews are not permitted to live in Kfar Etzion? Does Mr. Qurei have the moral authority to argue that Jews must be expelled (again) from Kfar Etzion because of the settlers’ behavior when his national heroes are murderers like Samir Kuntar and Dalal Mughrabi? Does he have the moral authority to worry about access to Jerusalem for “Arabs, Muslims and Christians” when Israel has allowed access to the holy places for all faiths, even after Jews were not permitted to set foot in East Jerusalem during the Jordanian occupation? 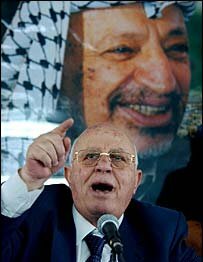 Does he have any moral authority at all when his PLO has been the world leader in terrorism and murder since the 1960’s? This entry was posted on Monday, December 15th, 2008 at 11:03 pm and is filed under General, My favorite posts. You can follow any responses to this entry through the RSS 2.0 feed. Both comments and pings are currently closed. Netanyahu recently attempted to secure Kfar Etzion in a deal that would give some remaining 6.8% of Israeli occupied territory to Palestinians. So now, are the Palestinians arguing to keep Kfar Etzion too?